These are based off of a $250,000 price and generalities, but you can see the difference. Waiting to buy a home in San Diego, and putting it off for another year, will ultimately cost you more money…like, a lot of money if you look at it over the course of time. 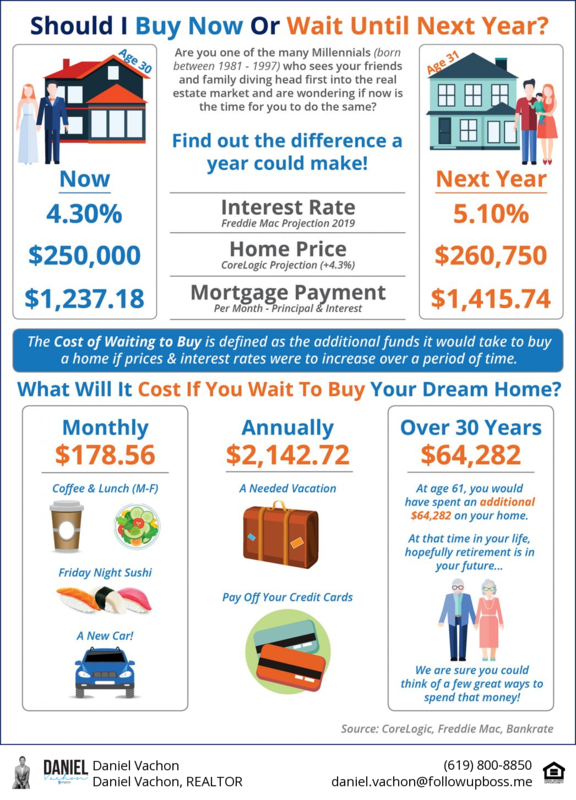 The definition of “Cost of Waiting to Buy” is the additional cost over the course of a certain period of time if home prices and interest rates are to increase. According to analysts, prices and rates ARE expected to increase. Freddie Mac predicts interest rates to increase to 5.1% by 2019. CoreLogic predicts home prices to increase by 4.3% in 2018. Waiting till next year to buy a home in San Diego will not benefit the average buyer. Are San Diego Home Values Really Overinflated?